Michael Dunlop powered to his second Isle of Man TT win of the week and the 17th of his career by taking victory in Monday's four-lap Supersport race 1. The Northern Irishman assumed the lead from Dean Harrison midway through the first lap and enjoyed a 10.5-second advantage by the finish. Scottish rider Adam Lyon was killed in an accident during the race. The 26-year-old from Helensburgh had been competing at the TT races for the first year. He was the second rider to lose his life at this year's TT, following the death of Manxman Dan Kneen in a crash during Superbike practice on Wednesday. 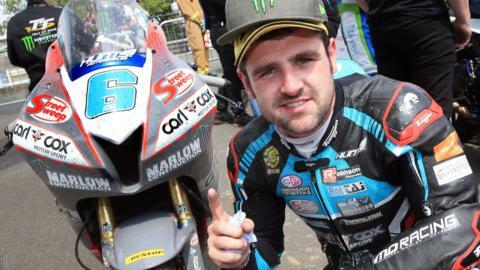 Supersport winner Dunlop broke his own five-year lap record with an average speed of 129.197mph. The Ballymoney rider won Saturday's Superbike opener and will compete in four more races during the week. Honda-mounted Dunlop, whose record had stood for five years, moves above Ian Hutchinson to become the third most successful solo TT rider ever, behind Joey Dunlop (26 wins) and John McGuinness (23). The 29-year-old now has seven Supersport TT triumphs to his name, four of those achieved on Hondas and three on Yamahas. "The bike went perfect and the pit stop was perfect but we can definitely make it better for Wednesday's race," said Dunlop. "I haven't had a lot of time on the bike but my boys have done a fantastic job and, with the right conditions, I think a 130mph lap could be possible on Wednesday. "It's fantastic - I felt good out there and I'm starting to ride a bit harder now." Dunlop led Yorkshireman Harrison by 1.7 seconds after lap one and gradually extended his lead with the help of that scintillating second lap. Lincolnshire rider Peter Hickman, riding a Triumph, edged out Kawasaki's James Hillier by 0.25 seconds for third place, with Manxman Conor Cummins and Australian British Superbike rider Josh Brookes making up the top six leaderboard. Twice-former-winner Gary Johnson was seventh, while Northern Ireland's Lee Johnston finished eighth.